If you are monetizing your blog with Google Adsense and tracking it thru Google Analytics then go ahead and integrate both to take a look in deeper side of monetization. Google Adsense and Analytics can be integrated with each other so that you can keep an eye on your referral links thru which you are earning maximum revenue or other sources of income thru Adsense. Google Analytics tells about the source of incoming traffic and popular keywords and at the same time Google Adsense tells you about the revenue generated thru CPC. Once you will integrate Google Adsense and Analytics, you would know the source of traffic thru which the user clicked on the Adsense ads and generated revenue for your site or blog. 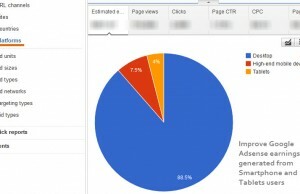 You can also track the keywords which attracted users to hit on an ad provided by you on your blog. Integration of Google Adsense and Analytics is very simple, You should have Google Adsense and Analytics on same Google Account. Now log in to your Adsense Account and then click on “Integrate your AdSense account with Google Analytics” on Report Overview page. Now step by step execution of automated program will link your Google Analytics with Adsense. If you are attaching with Primary domain then no need for another tracking code at all. There are lot many benefits of integrating these two products but the most important one is that you can now track the page views and income at single place.